If you’ve been following us on Instagram lately, you’ve noticed our recent partnership with Four Roses Bourbon, telling the story of how it all began, 130 years ago, in the heart of bourbon country and the United States. The series, dubbed “A Tale of Four Eras” celebrates a few distinct inspirations for 4 classic bourbon recipes (and one bonus), each centered around the different expressions of the historic whiskey. The Four Roses Bourbon saga began when the founder of Four Roses named his Bourbon as a symbol of his devout passion for a lovely belle, which he after that applied to make good whiskey. It is no coincidence that we tapped into a few of the best bartenders in the country to come up with recipes that can be easily replicated but are oft misrepresented as ‘simple’ or ‘beginners’ choices among the many options you have right now. That notion couldn’t be further from the truth. Drinks are what we make them to be but ultimately they are always the absolute sum of its ingredients so each input matters, starting with the spirit of choice and craft-oriented preparation. When we spoke with Jason Yu - Los Angeles-based bartender, who worked for many of the top whiskey programs in the city, he was clearly set on deconstructing the Old Fashioned, right at the vertex of sweet, spice and of course, spirit. It’s a simple recipe for getting to know any spirit better as the sweet and bitter taste notes should open different (hopefully good!) notes in the spirited cocktail. And while most recipes call for a classic 2 oz. pour of bourbon to a sugar cube, properly diluted with a few dashes of Angostura, there’s very little about this cocktail preventing you from going off-script, adding more spirit, perhaps a stronger proof and different bitters, ranging from orange to more fall-like flavors such as spice and walnut. How do you construct a cocktail that evokes the history of a building? This is not any building, by the way. Located in Lawrenceburg, Kentucky, the Four Roses Distillery was built in 1910 and is listed on the National Register of Historic Places. “It’s one of the OGs of bourbon” — a perfect quote by Spirit and Spoon, another cocktail artist which collaborated in this project. The Spanish mission-style architecture is rarely seen in Kentucky so it seemed quite fitting that our partnership with Josh Suchan would result in this fine Tempranillo-topped oregano-and-bay-leaf-sweetened Spanish expression of the legendary egg white cocktail. I once enjoyed a drink at a popular London-bar right next to Steven Spielberg and to no surprise, he ordered a NY Sour. I could tell the bartenders were a bit thrown off by Mr. Spielberg’s request. Maybe it was a London thing. Maybe it was a bourbon thing. I’ve been drinking my sours with a red wine topper ever since. Shaken vigorously without ice first to ensure proper frothing, while adding ice at the end before pouring it into a high-ball with more ice. It’s a Spanish drink and it’s built for the heat so it’s made for enjoying it always cold, like a Spanish Tinto Verano. 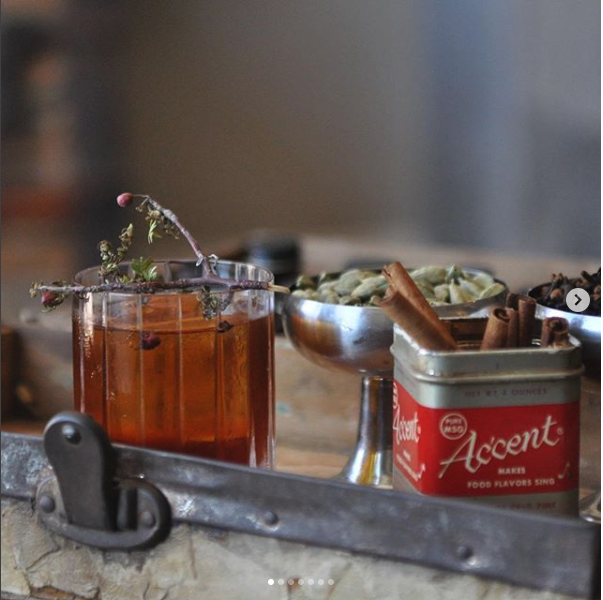 Next, we caught up with the man behind the stash @spiritandspoon and his cocktail the Kentucky Boulevardier, a herbaceous spirit forward sipper reminiscent of the Post Prohibition times. 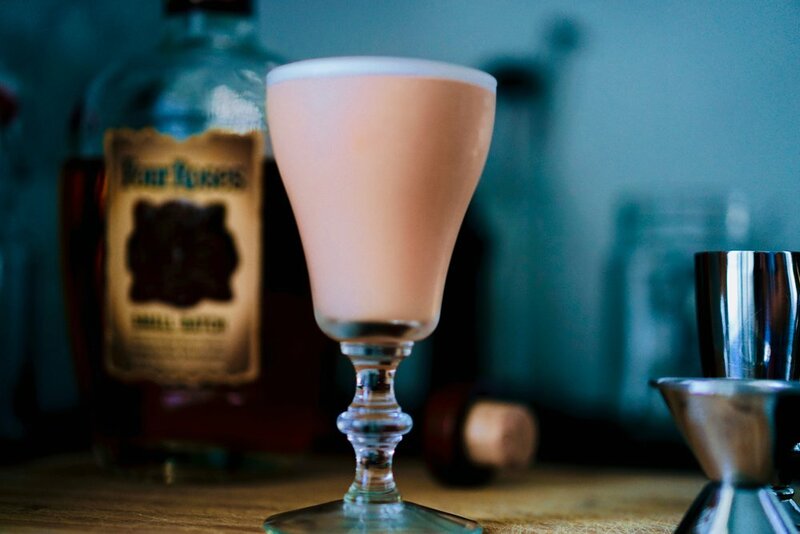 This drink certainly makes us reflect a bit on whiskey’s rich history and how great it is to live at a time when is cool to "re-drink” so many classic recipes. During the Prohibition, the only way to get any whiskey was through “Medicinal Purposes Only.” So Karl’s drink playfully attempts to replicate that. Bitterness is a misunderstood taste dimension that when applied correctly, can also bring out the best in spirits and hey, people too! Whiskey for the cure is a thing. As long as it in moderation, of course. Apply a 45-second stir to adequately dilute the higher proof alcohol and Amari in the cocktail. Served with a bigly ice and a flaming lemon twist. Karl’s drink is the perfect companion after a long day or as a casual afternoon pick me up... or as a brunch - "I got nothing to lose" cocktail option. Whiskeys are made to mix with Amari and these are two among the many possibilities given so many different choices of Italian aperitivo out there. What’s the best way to start your day? Coffee infused bourbon! Our friend Richard Ellison showed his love for the Small Batch Expression in his bottled cocktail, made in celebration of the 130th anniversary. We are excited to hear there would be an Anniversary version of the Small Batch so it was an easy choice. Richard also surprised us with his inspiration for long awaited Fall, creating this “encore” recipe we labeled the Spiced Old Fashioned, the perfect companion for any Fall afternoon. Combine all ingredients into mixing glass with ice and stir. Strain into chilled glass and garnish with expression of lemon and cloves. Let us know your thoughts about “A Tale of Four Eras” featuring Four Roses Bourbon, part of the recent Four Roses Bourbon takeover and collaboration in celebration of 130 years of history as told by four of the best mixing artists in the game.